A new Battlefield: Bad Company 2 patch that strips out the game's DRM has been released but you're going to need some patience to get it. 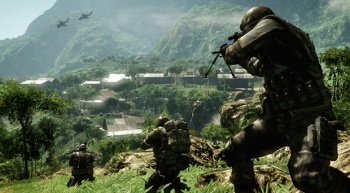 Battlefield: Bad Company 2 has been around for awhile now but DICE is still giving it plenty of love. Released today, the newest patch for the PC version of the game addresses a number of performance-related issues but will probably be most attractive to players because it strips the SecuROM wrapper out of the game. There aren't many things that make Team PC happier than waving bye-bye to DRM, particularly when the DRM in question is the much-loathed SecuROM. The bad news for anyone lacking a super-phat pipe is that the update is a whopping 2.6 gigabytes in size. "The patch itself contains all previous patches rolled into one," DICE explained. "While it would have been technically possible to create a smaller patch for those who have Client R10 installed already, that would have delayed the release of the patch even further - so we thought it better to release a larger patch now, than a smaller patch sometime in the future." There is one small technical issue with the patch: if you use non-English characters in your Windows username, PunkBuster will not activate properly. DICE only became aware of the issue at the end of the testing process and decided to let it go anyway rather than delay it further. The new patch will be automatically distributed through Steam or the BFBC2 auto-updater. Links to a manual patch for the non-Steam version of the game can also be found on the EA forums.